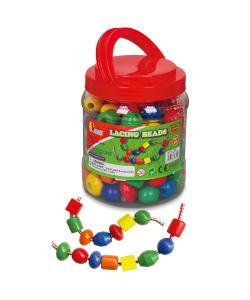 This jumbo tub of brightly coloured wooden beads are educational as well as fun! Children can create endless different designs by threading the wooden beads along the lace and combining the different shapes and colours. All of the beads and laces can be stored in the screw top jar with its built in carry handle. Includes 90 assorted colours and shaped beads and 5 laces. Helps to develop dexterity and concentration. 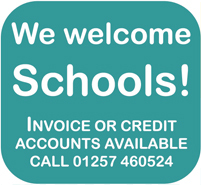 An ideal way for creative children to learn about basic numeracy, colours and design. Beads and laces can be kept tidy in the screw top jar with its built in carry handle. Also ideal for improving concentration levels, dexterity and hand/eye co-ordination.